Soft-tip darts are mostly used on electronic dartboards. 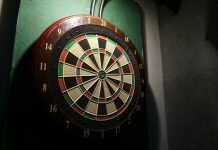 Everyone knows that even with a proper technique, darts often bounce right off electronic dartboards and fly into wall or hit the ground. 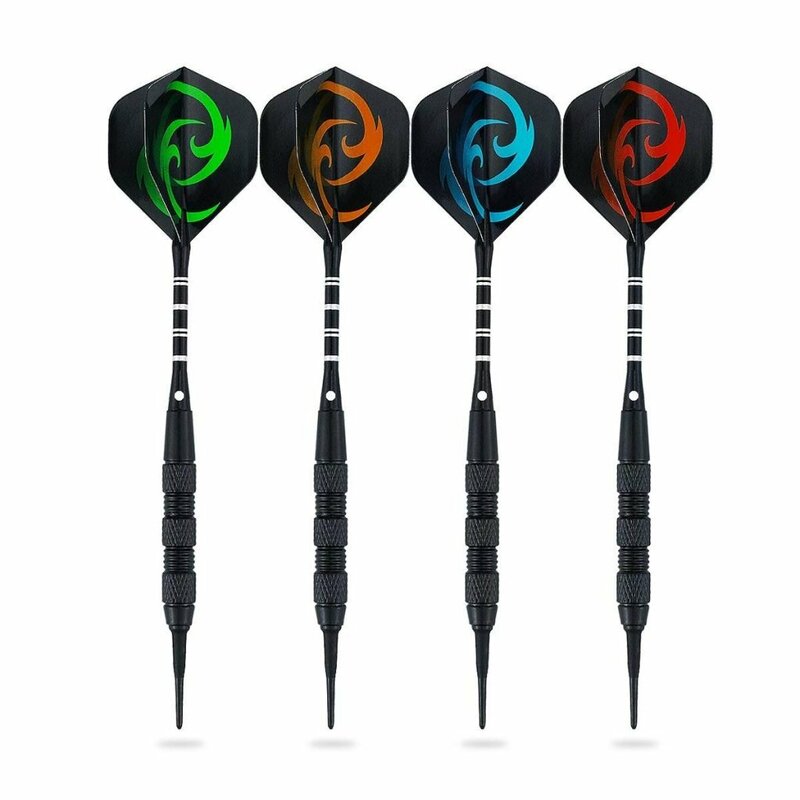 Having the best soft-tip darts for beginners is not always about getting the best aerodynamics and grip, although those help a lot too. Sometimes the best simply refers to having darts that can withstand the punishment. There are multiple components that make up a dart, so everything should be durable from tip to flight. Below you’ll find different alternatives of what the best may look like from a buyer and player’s perspective. You can find the Viper Sure Grip in two weight classes: 16g and 18g. This is nice to see as the low weight makes them very easy to learn the sport with. The Sure Grip has an interesting design which features a 2BA reinforced tip, aluminum locking hole on the shafts, and a rubber grip sleeve that helps improve your release. These darts are ergonomic and balanced as far as aerodynamics are concerned. The extra-secure locking mechanism allows you to play for longer before you need to refit them. The slim flights have a holographic design which looks cool but the fit is not amazing. The overall quality of the Sure Grip is impressive and the price is ok for a 3-pack deal. These darts are engineered for use with electronic dartboards. This is one of the cheapest 12-packs you can find, though the quality could stand to be improved upon. 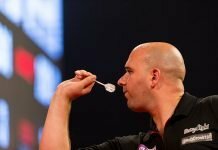 On the bright side, no matter how wobbly the tips may be, you do get 200 soft tips to use with your 12 darts. You also get 16 flight replacements and you get to choose between four different styles. Although there’s no rubber grip on the barrel, the design features striations and grooves that should give you a solid grip on each throw. However, you will have to dry your hand after a while since moisture won’t do you any favors without a rubber grip. These darts are expensive for a reason. 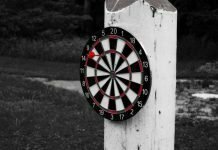 They’re by the top brand in electronic dartboards and probably the best soft-tip darts for beginners and intermediate players. 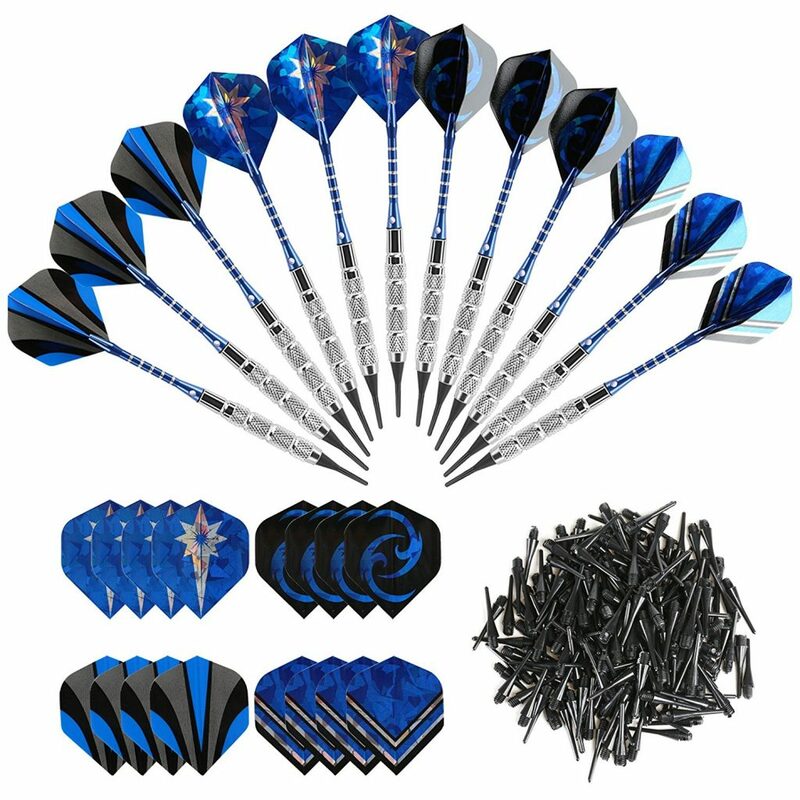 The Arachnid Tungsten Soft Tip Darts sets come in at a consistent 18 grams and you can choose between 80% or 90% tungsten composition. The aerodynamics is superior to a lot of other models on the market, and the durability is off the charts. Treat them well and they might just take you from zero to pro without breaking. What’s even better is that the package includes three spare flights, seven spare points, three spare aluminum shafts, as well as a sturdy deluxe carry case with a clip-on feature. You’ll already look the part even if your game still needs improvement. Another beginner and budget-friendly option would be the Cyeelife Soft Tips Darts 15-pack. The overall quality is above average but even so, you get plenty of replacements to deal with any issues along the way. 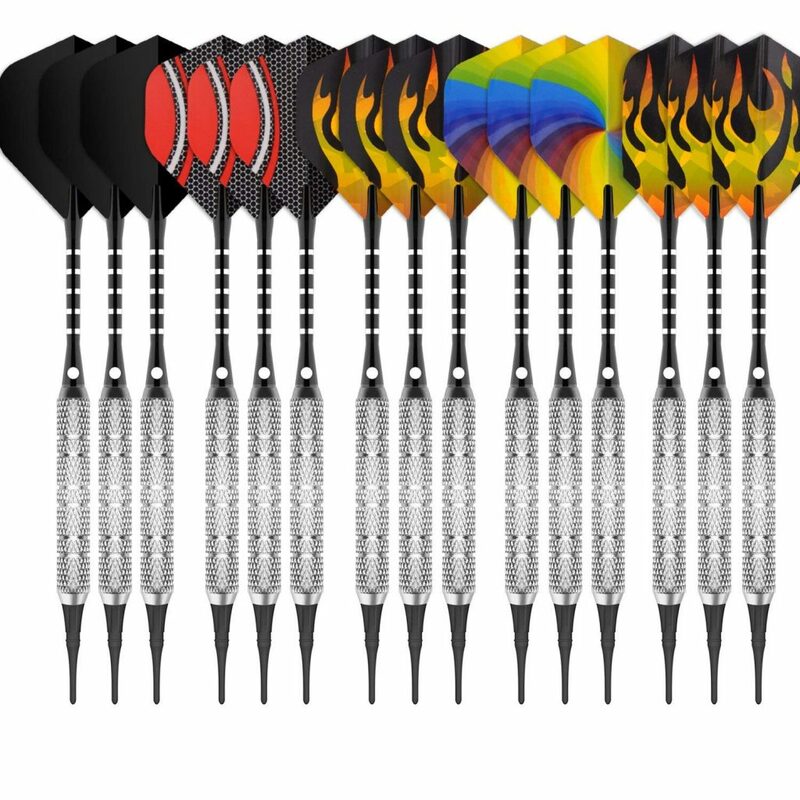 The pack has 15 darts, 180 soft tips, 30 flights (both standard and slim styles), and 15 replacement aluminum shafts. If you’re looking for value for the money, these might be the ones. You can have enough darts in one pack to play with your entire family or friends without exchanging hands after each round. The level of precision that you can achieve will depend a lot on your skill, but you shouldn’t expect professional-level performance. Wolftop doesn’t make the most durable soft-tip darts, but they make up for this by offering good balance, a cool finish, and budget-friendly price. The nickel-plated barrels are well-balanced. They also have a decent grip thanks to the large grooves. Coming in at 17 grams, they’re good for beginners of all ages but they start losing value as the player’s technique improves. This 12-pack also comes with 36 extra tips but not replacement aluminum shafts or flights. However, due to the quality of the locking mechanism and tight fit of the flights, these replacement parts shouldn’t be needed for a long time. When it comes to the best soft-tip darts, there’s only one material that stands out. If you want the best balance and impact resistance, there’s no better choice than tungsten. 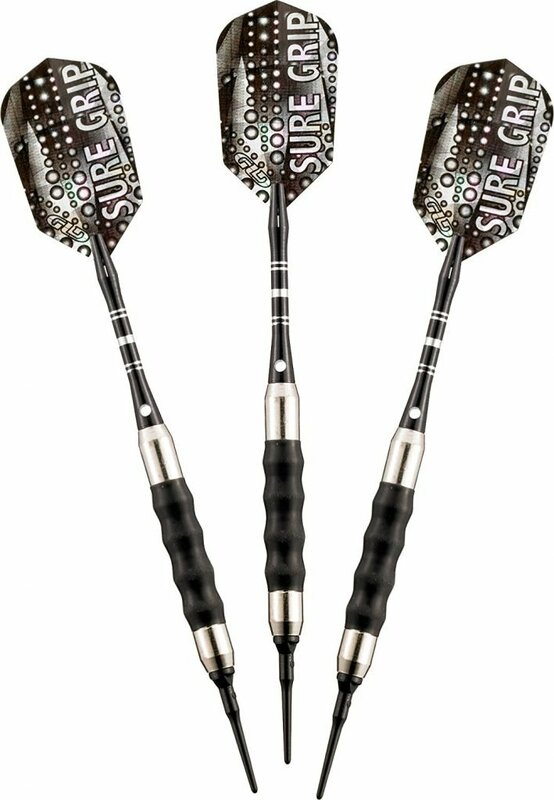 Soft-tip darts that have a 90% tungsten composition will handle intense daily use. A titanium finish also helps with impact resistance, although it may not be as flashy as painted soft tip darts. However, if you’re shopping on a budget and you’re certain you’re going to hit the board instead of the wall or the ground, brass is a solid option too. It’s quite durable for the most part and it comes at a cheaper price. The most popular soft tip darts weigh either 17 or 18 grams. The latter is the best choice at any given time as it provides enough weight even when you’re starting to refine your release technique. Having a ton of tips, flights, and shaft replacements may seem like you’re getting a better deal for your money. However, that’s not always the case. More replacements may simply mean that the overall quality of the soft-tip darts is not as good as advertised. On the other hand, if you’re buying them for kids, sometimes going for less quality and plenty of spare parts is advised. 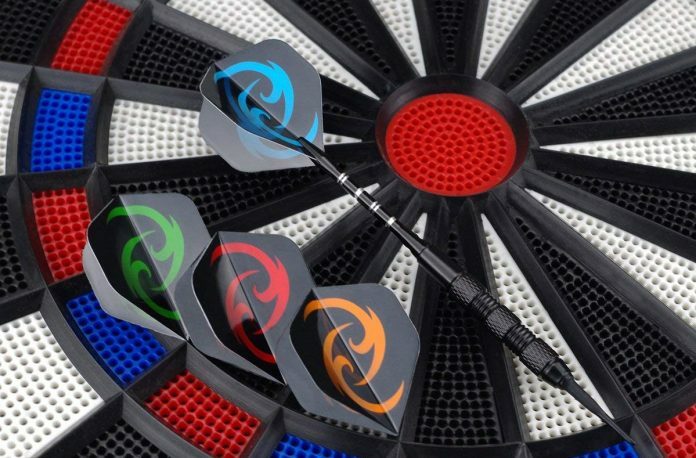 Picking the best soft-tip darts isn’t just about finding the most comfortable fit for your hand. Depending on how good you are and what level of quality you’re looking to get, you may need to look for specific features and learn to adjust to them. 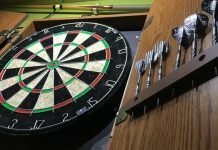 Any set of soft-tip darts discussed in this article is a good choice if you’re learning the sport, and some of them may even last you a lifetime.